Question: How can I get lavender to grow in pots? One died, and the other, Spanish lavender, isn’t doing too much better. I wanted lavender with a beautiful, soft scent. But neither of them was the right one. Answer: I can understand why you want to grow lavender in pots - they look so lovely spilling out of containers, and it's nice to be able to brush you hand against the foliage as you walk by. To get the lavender with the scent you're looking for, you need English lavender. English lavender (Lavandula angustifolia) has more silvery-gray foliage and more closely packed blossoms than Spanish or French lavenders. It's also more fragrant. Look for varieties called 'Munstead' or 'Hidcote'. Lavender isn’t happy in pots unless conditions are perfect. The pot needs to be a good size to accommodate the root ball. It also needs dry air, so if it's very humid where you live, lavender will struggle. It needs full sun, gritty soil, and perfect drainage, and the soil should dry out between waterings. If you keep it slightly moist like you would most other container plants, you'll kill it. Treat it more like a succulent. Use a time-release fertilizer once a year. Don’t overfeed. Other than the Mediterranean, where it originates, and the more arid areas of the west, where conditions are similar, lavender is often not a long-lived plant, due to humidity and soil that’s too rich or moist. 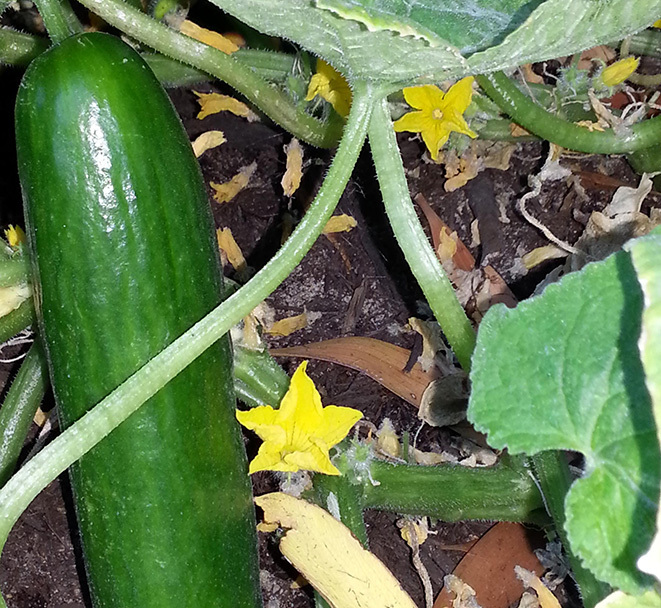 Question: Why do my cucumbers flower but do not fruit? Answer: There are both male and female flowers on the same cucumber plant, and sometimes the male flowers show up a few days before the females. Usually the female flowers aren’t far behind, but if they do appear and they still aren’t being pollinated, it could be that there aren’t enough bees around to do the job. Luckily, squash is pretty easy to hand-pollinate. First learn how to tell the difference between male and female flowers. Female flowers will have a rounded swelling behind the blossom – the potential cucumber – whether it’s been pollinated or not. Male flowers won’t. Using a soft-bristled paintbrush, transfer the pollen from the stamens of the male flowers to the stigma of the females. If successful, in a few days you should see cucumbers. Question: Due to the severe winter in Connecticut I lost one pyramidal boxwood shrub: it was beside my front door and I used calcium chloride (ice melt). I have six globe-shaped boxwoods in front of the house and I just noticed each one has a few dry spots. Is this typical and what do I do to prevent this from recurring? I do watch the show every week and enjoy the beautiful gardens and tips. Answer: Boxwood (Buxus) is a lovely, evergreen shrub with small leaves. Under the right conditions, boxwood can live for decades. Freezing (and then thawing) temperatures and winter winds are not the right conditions. Even if you have varieties bred for northern regions, it sounds as though the extreme weather New England endured last winter took a toll on your shrubs. You should cut the dry areas back to live wood and thin the plants so the areas receive enough sunlight to send out new growth. According to the U.S. National Arboretum (usna.usda.gov), early winter is the best time to do this. Their website has information on how to thin boxwood. There are differences of opinion about covering boxwood with burlap or other breathable material for the winter. A healthy boxwood that gets enough moisture and isn’t in too windy a spot shouldn’t need covering. Mulch around the shrub and be sure to keep it watered but not waterlogged. Do cover them if the shrubs are in the path of harsh winds, in a southern exposure that receives full winter sun, or could be exposed to salty air or water (including ice melt). Question: Why won’t my hydrangea bloom? Answer: There are a number of types of hydrangea, so it helps to know which kind you have. 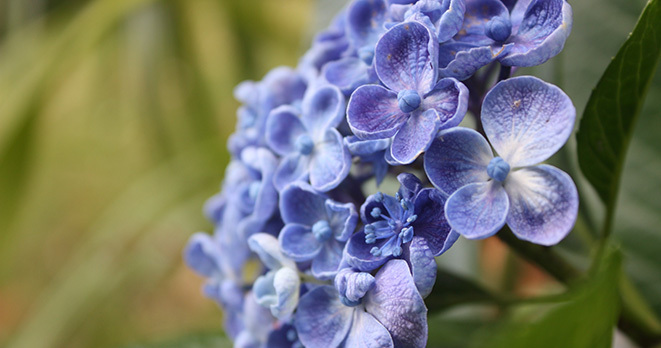 The most common reason a hydrangea doesn’t bloom is lack of sunlight. Hydrangeas are shade plants, true, but you’ll only get leaves in full shade; they do need a few hours of sunlight a day in order to set buds. Pruning at the wrong time of year can remove the flower buds of some hydrangeas, especially mopheads (H. macrophylla). Another reason some hydrangeas don’t flower is a late freeze killed the buds on the plant. Transplant the shrub, if it’s small enough, to a more sheltered area of the garden, or watch weather reports and if a freeze is expected, cover the plant with a sheet or row cover. If those methods don’t work, look for a more cold-hardy variety, such as peegee hydrangea (H. paniculata) or the native Annabelle hydrangea (H. arborescens).